Normally when you think of Goa you imagine picture perfect, palm-fringed, sandy beaches by day; sunset cocktails, beach bars, music and parties by night. From what we’d read that’s pretty much true…at least in high season, but what about in low season, during or at the tail-end o the monsoon? This is the time when most of the resorts and beach huts are shut down or closed for maintenance, swathed in blue and yellow tarpaulins. A high proportion of the beach bars and restaurants also shut up shop due to the drop in tourist numbers. This was definitely the case when we visited Palolem Beach in South Goa. 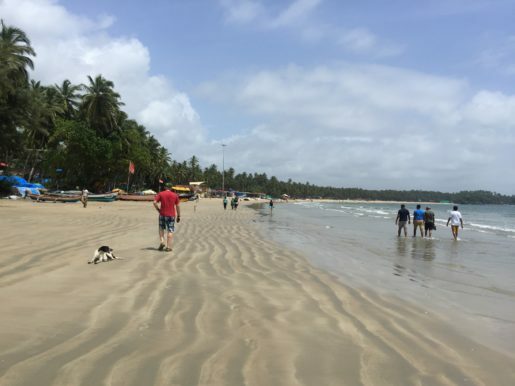 Many people avoid Goa during low season and would ask why on earth visit Goa when you’re likely to spend much of your time drenched? Well, due to the timing of our trip to India we ended up doing just that. 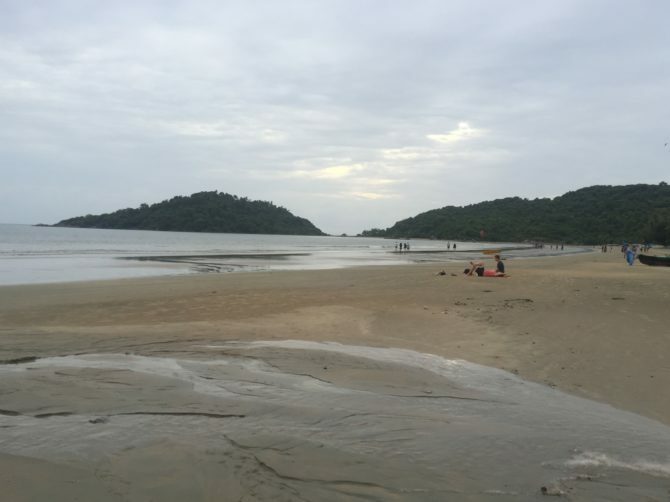 We spent four days in South Goa, in a beach hut just back from Palolem Beach in low season. To be fair it wasn’t the middle of monsoon but towards the tail end, even so, we still got wet…very wet; but, and it’s a big but, we still loved it. The rain didn’t put a dampner on it for us…except for in the literal sense of course. 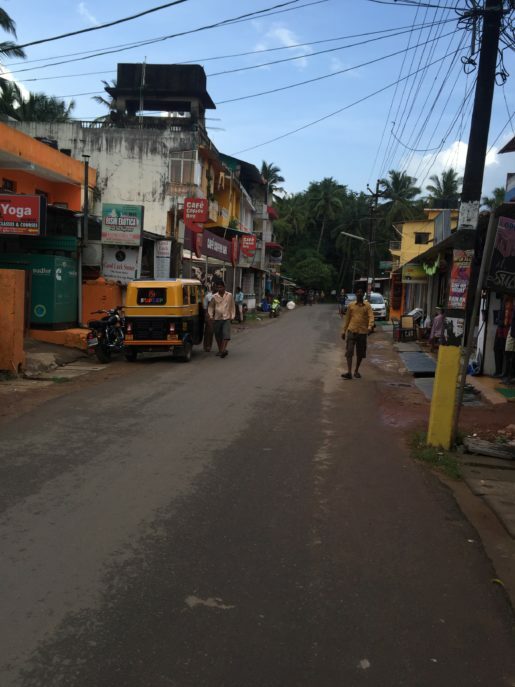 We opted for South Goa over North Goa, which is said to have more of a backpacker/ party scene. Whilst we love a good party we’re more into lower key bars and restaurants rather than the trance and all night beach parties North Goa is renowned for. To find out more about less touristy places in Goa read this blog post about Offbeat Places in Goa. Our taxi dropped us off at Palolem Beach after a very rainy ride from Goa airport. The second we’d left the terminal building the heavens had opened and drenched us with a deluge of warm rain. This continued for the entire hour-long journey, showing no signs of letting up! 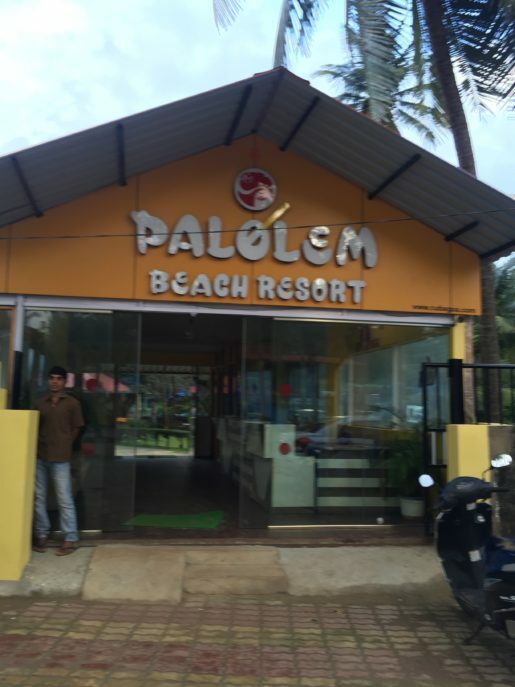 We’d pre-booked four nights in Palolem Beach Resort. It probably wasn’t necessary to book anywhere, but we didn’t want to leave it to chance. It was the end of the Ganesh Festival (Ganesh Chathurthi) and we’d heard on the grapevine that the limited accommodation was getting booked up. The resort was okay although a little run down, mainly because of the offseason maintenance going on, I think. Everywhere was green and lush and the usual high season throng of tourists was now depleted with just a handful of westerners, outnumbered by a slightly larger number of Indian’s visiting to celebrate Ganesh Chathurthi. This meant uncrowded beaches, less traffic, and lower prices etc. It also, of course, meant there were less accommodation and restaurants, but this didn’t ruin it for us at all. It turned out to be just what we needed after a very busy few months and hectic three days in Mumbai. We were ready to relax and take it easy for a few days. So whatever do you do in South Goa when it’s always raining and there’s very little open I hear you ask? The answer is to kickback and chill out with a book and a beer or soft drink, and when you get bored of that embrace the rain and explore. Getting caught out in a torrential downpour of lukewarm rain is great fun and because of the high temperature you soon dry out…until the next deluge that is! 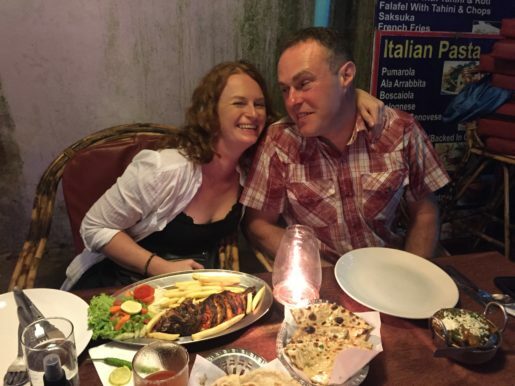 We spent our days wandering up and down Palolem beach, pottering around the couple of streets behind it, eating delicious curries, and drinking the odd kingfisher beer or three. Palolem beach is a beautiful, gently curving stretch of sand, set facing a calm bay, lined with palms swaying in the breeze. It’s set between two headlands, the one to the right is called Monkey Island and can be reached by foot at low tide. Pulled high up on the beach are numerous coloured fishing boats and lots of beach wildlife to keep you entertained. Volleyball playing cows, soaring sea eagles, lots of lazy dogs, and cawing crows. You can see a video clip of Andy’s take on this here. 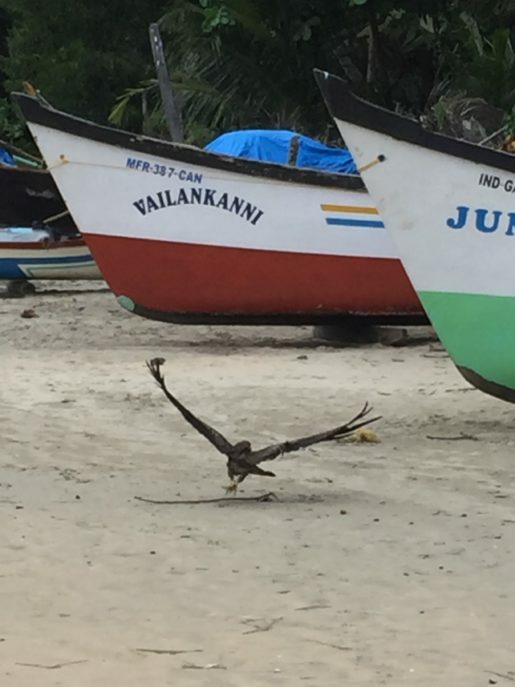 A little warning at this point for anyone visiting probably any beach in India. ‘BEWARE OF THE COWS’. 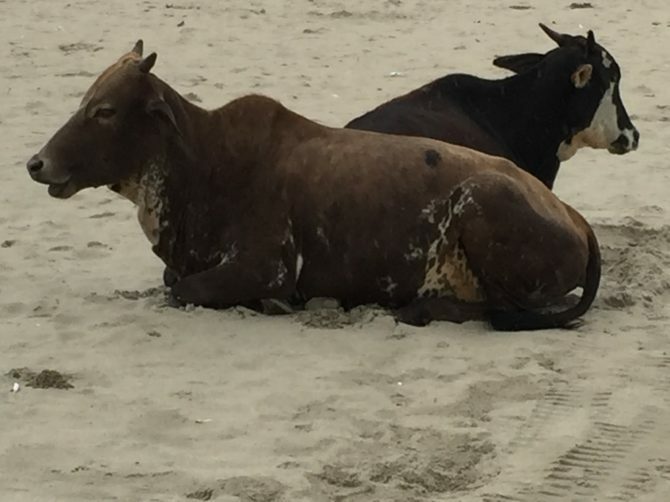 I had an extremely close encounter with a Holy Beach Cow of the horned variety. There was a short break in the rain, so Andy and I popped down to the beach so he could video the beach wildlife. Unbeknownst to me whilst I was busy trying to look a bit less dishevelled for the camera, a cow was sidling up behind me. Suddenly with a big grin on his face, Andy said: “look behind you”. I turned around and was confronted by a friendly looking brown cow, now as you know looks can be deceiving as I was about to find out. Now I love animals and took this as the perfect opportunity for a beach cow selfie. The cow, however, had other ideas and promptly butted me, full force in the thigh with her horn. Much to the delight and amusement of the crowd who had gathered to watch and my darling husband who nearly wet himself laughing. It soon became apparent he’d also caught the whole encounter on film…definitely a you’ve been framed moment! The town itself is a typical beach town consisting of a couple of streets filled with stalls and shops selling clothes, handicrafts and other souveniers, along with a few restaurants, a bookshop and a couple of internet cafes. There are also some places you can go for yoga classes or an ayurvedic massage, we didn’t partake in these though as it’s not really up my street, I don’t like being mauled about and don’t have the patience for yoga. A highlight from our rainy days in Goa was a mini trek to the top of Monkey Island at low tide…again in sheets of rain. I’d recommend this but remember to take your insect repellent as there are some nasty biting flies at the top at sunset and also wear some good footwear as the rocks can get very slippery. Walking back afterwards, just as the sun started to set we noticed the beach appeared to be moving slightly in front of us and under our feet. On closer inspection, we realised it was covered in millions of tiny baby crabs scuttling everywhere giving the illusion of the sand moving. During our time in Palolem, we were also lucky enough to witness two Ganesh Chaturthi immersion ceremonies. These happened around 11 pm and were basically when the locals bought effigies of Genesha the Elephant God down to the beach in trucks covered in bright lights accompanied by loud music and lots of firecrackers. They then performed a ceremony on the beach before walking the effigies into the sea, where they disintegrated and were taken away by the waves. You’ll also find the locals very friendly and more than willing to pass the time of day with you and maybe even get involved with what they’re doing in their everyday life. Andy helped launch one of their fishing boats, by placing greased timbers in front of the boat and sliding it down the beach towards the water. We were also surprised and amused by the repetitive requests for selfies with us, mainly from groups of young Indian men on the beach but also some families. The few places we ate in, in Palolem served a selection of Indian, Chinese and Western food, we pretty much stuck to a variety of vegetable curries, dal and roti’s, veggi, not for any particular reason other than they were so delicious. Our favourite place to eat was Dropadi down on the beachfront, serving a huge selection of excellent curries. We also stumbled upon The Olive Room just back from the beach on our last night where you could choose from fish caught that day displayed on ice at the front. I went for tandoori red snapper – delicious. At this time of year you won’t find much partying going on in the evenings, most places shut by midnight. You’ll have to be satisfied with good food, a few beers or cocktails and some evening beach strolls if the weather allows. If you do fancy a later drink, Cocktails and Dreams next to Dropadi on the beach front stays open 24/7 (or at least for as long as it has customers). 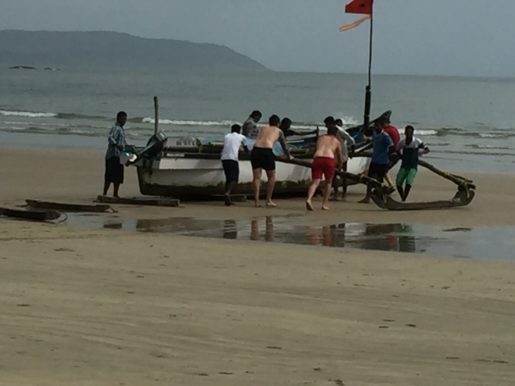 So there you are – how we managed to while away four rain filled days on a beach in South Goa. We’d love to go back and experience it in high season but for now are more than happy with our damp, relaxing break at the tail end of monsoon. We really enjoyed it and would encourage anyone to visit at this time of year for something a bit different. Finally just to give you an idea of what Palolem looks like in the sun. A photo from the last day when the sun finally managed to burst through the clouds for an hour or so. If you have more time in Goa than we did you may wish to explore further afield in which case this insiders guide to Goa will be a huge help. Be careful about requests for selfies. Many of the indian men want selfies with female tourists for perverted reasons. They often show them to their friends and claim to have slept with the tourist with whom they are pictured with. Yes absolutely, that’s very true! Palolem beach one of the beach in South goa and also top ranked in Indian Beaches. It’s really very upset about cow attacked you faced. Thanks Rajiv! I love funny animal stories! I went to Palolem beach many years ago (during monsoon too!). One afternoon I was lying on the beach and woke up to find a cow licking my face, it was gross!! Haha, that made me laugh! I’m glad I’m not the only one that attracts unwanted attention from animals ? Haha, more bewildered than upset! It was quite funny in hindsight! Yes Ganesh Chaturthi was really cool and interesting to watch. The rain didn’t ruin it for us but a bit of sun would have been nice! Nice post to be read. 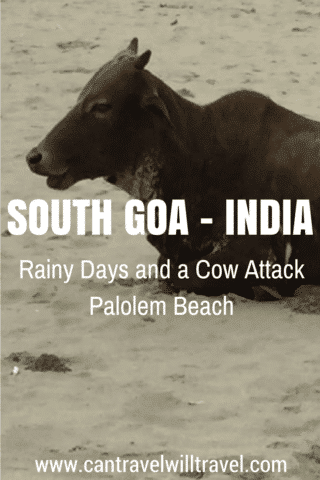 Its very delightful to read about cow attack in palolem which is really a very new to me. But I keep this point in mind when i visit Goa this winter. An amazing post indeed!! Thanks Vino. Yes it was a funny experience…it made us laugh alot afterwards. Goa was lovely we just wish we’d had more time to explore more!